Previous and other features can be found under the Features drop-down menu above. Last year's Features can also be found there in their sub-menus. Lifelong friend and fellow folk legend, Norma Waterson, describes her as ‘a formidable woman’ and, despite being one of folk music’s most influential artists and songwriters, Peggy Seeger is almost as well-known as a political activist. Born in New York in 1935, her mother, Ruth Crawford, was a classical composer and a piano teacher and her father, Charles Seeger, an ethnomusicologist. 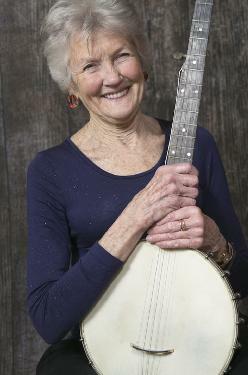 She is half-sister to the late Pete Seeger, long considered the godfather of the American folk movement. As partner of Ewan MacColl, she inspired one of the twentieth century’s most popular love songs, ‘The First Time Ever I Saw Your Face’. Her autobiography and memoir, First Time Ever is out now. I interviewed this remarkable woman at her home in a leafy corner of Oxford. Warm and welcoming but quick to correct inaccuracies in my questions, she’s (ever-so slightly) impatient to discuss present concerns, rather than her fascinating past, which she says ‘people know already or can read about in the book – Nicholas John. Shire Folk: You write in the book that your political life has ‘intertwined with song-writing’. Whenever I hear a reference to you, it’s as folk singer and political activist. Are you happy with that balance? PS: Oh yes. Writing a song can be political activism. But I’m not as much an activist as many people. To me, real activists are people who lie down in front of tractors at fracking sites, or help with refugees. Everyone should do what they can and what they do best. I have written some songs that have made an impact. The two songs I’m mostly known for are ‘I’m Gonna Be an Engineer’, which is a feminist anthem, and ‘The Ballad Of Springhill’, which I wrote back in 1959, or ‘58, about a pit disaster in Nova Scotia. I seem to have written a song about most everything. PS: It wasn’t a political upbringing, it was a progressive upbringing. In the circles my parents were in, you didn’t call yourself left wing, you called yourself ‘progressive’, although my father had been a member of the Communist party in the 1930s. My mother wanted children, which got in the way of her classical playing. She was also an excellent piano teacher and the way she taught it was a vocation, a profession, a career. I grew up with music all around and I learned that music was meant to be listened to – you don’t talk over it. These days music is just a part of the background noise. SF: You’d learned to play piano aged six and the guitar at ten and then more instruments from there? PS: I come from two extremes, of classical music at one end and folk music at the other. When I came over to England, I played guitar and banjo. I never played piano in folk music, still don’t. I then learnt to play the autoharp because certain songs seemed to need it. And then I played concertina, purely and simply to accompany Ewan. It’s an English-sounding instrument and the guitar was being over-used. The dulcimer is a very sparse-sounding instrument and it sounds wonderful with the old traditional songs. I learned the traditional songs when I learnt the style of singing folk, which I had to learn because I wasn’t born on the porch of an Appalachian cabin, I was brought up in middle-class Washington! When you sing songs with a bel canto opera voice, you take away one of the main features of folk music; similarly, if you sing ‘La Traviata’ with the high, lonesome sound of the Appalachian Mountains, if wouldn’t be opera any more. When you talk about a type of music, you’re not just talking about the words and music, you’re talking about the style. SF: You grew up in a time of great political unrest in the United States, now called the McCarthy era. What do you remember from that time? PS: My father was about to be blacklisted when he quit his job. Pete Seeger was blacklisted and brought before the House of Un-American Activities Commission and he got a sentence of a year and a half in jail, which was later repealed. It would be very easy to bring McCarthy back now. After the war, everything was up in the air and no one really knew what was happening. All kinds of morals and ethics were being turned upside down. PS: My father was wonderful, he never objected to my heading off and travelling, even though it wasn’t common then for a single woman to travel alone. I wanted to do everything! I had an adventurous streak. Probably why I was tired of living out of a knapsack by the time I was 24 and ready to settle down with Ewan McColl. SF: You were recently involved in the ‘Save Otmoor’ campaign at North Oxford, against the proposed building of the Oxford to Cambridge expressway. What are your feelings about the world we’re living in? PS: ‘Save Otmoor’ has been fantastic but we need to support the other villages in the area threatened by this road. Any road of this size will affect communities within 510 miles and there is talk of building a million new homes along the route. It’s incredibly important that every little community takes a stand if it’s threatened by road-building, fracking or gerrymandering. I’m really angry about what’s going on. We have to talk about rampant consumerism, over-population and climate change. We certainly need to talk about fracking. Fracking breaks up everything nature has made: it ruins the land and the water table and completely disrupts and eradicates wildlife permanently. Sadly, there is ignorance about the importance of nature in our lives. SF: You’re still singing and touring today and folk music is enjoying a resurgence: what are your thoughts on the current folk revival? PS: There have been folk revivals since Sir Phillip Sidney went onto the streets of London in the 1600s and told people to ‘listen to the street singers, they’ll be gone soon!’ And it would always come back, usually fuelled by academics and collectors. The songs of England and Scotland (and Ireland to a certain extent) have been wonderfully anthologised and written down, books and books of them. And of course the English Folk Dance and Song Society has been going since 1932 and is now sponsored by the government. I don’t play enough folk clubs nowadays to really know how things are, but Oxford has a really good folk club at The White House. Our folk music also has something here that doesn’t exist anywhere else in the world – and that’s pubs! SF: Are you still writing and recording new material? PS: I am still writing songs and I think that producing music is possibly more important than consuming it, but there’s a problem with recording albums as no one is buying music in the same way as before. I can’t use digital – I like to see the little wheels moving round! First Time Ever was named a Sunday Times, Guardian, Observer and Financial Times Book of the Year and is published by Faber & Faber.